The ridge—a thin line of shattered limestone, green and orange with lichen—felt more like the promenade around a lookout tower than the top of a mountain range. Thousands of feet below on either side, the valley floor seemed to spread directly underfoot. Far to the east ran the line of the Wasatch Range and Utah Lake. To the west lay the empty plains south of Tooele. To the north, I could make out a slip of water from the Great Salt Lake. The fight to the top had been epic. I'd lost my trail among the cow-trodden paths below and, looking up nearly vertical glacier-carved lines, I'd momentarily doubted the wisdom of an upward scramble. In the end, I'd climbed determinedly straight up the bold face of the safest spur ridge, ignoring multiple failed attempts at mutiny by my dogs, who periodically fled off the bare shoulder of earth into the pines to rest panting in the shade. The hike to Kelsey Peak in the Oquirrh Mountains was supposed to be easy: Four hours out and back with a slight elevation gain. Along with my lunch and CamelBak, I'd packed some dog biscuits and an extra half-gallon of water with a collapsible bowl for my four-legged companions. It appeared that the hike to Kelsey Peak would be dry and hot. But what did I know? 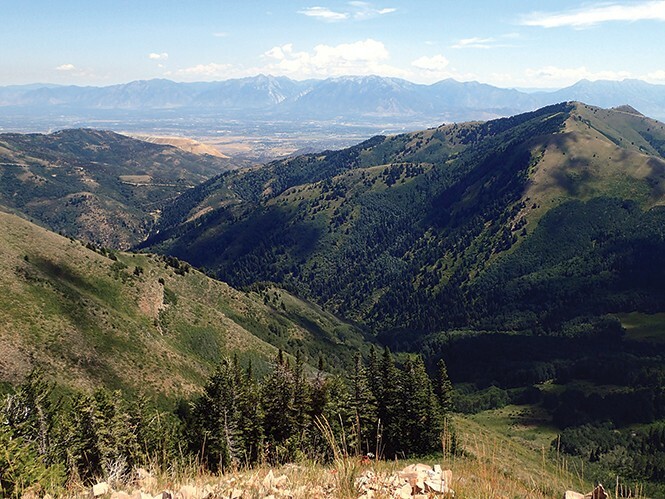 I'd never hiked the Oquirrh before, and I didn't know anyone who had. The Oquirrhs are an ignored mountain range. This can be a good thing, if you like solitude. Or, it can be a problem, if you want some verification that you're actually headed in the right direction. Try as I might, I could not find a single guide book or printed map of the Oquirrh range. I tried a number of local camping stores with no luck, so I would recommend doing what I didn't, and going to the Utah Department of Natural Resources bookstore on North Temple, which sells topographical maps of the entire state. By the time I started out on my adventure, all I knew was that once I reached the parking lot, I would find three so-called trailheads, and I wanted to follow the most western of those starting points. In an attempt to stay on track, I'd also scribbled some notes down on a piece of paper, a list of GPS points for various peaks in the area—including my destination, Kelsey Peak—and some waypoints by which to check my progress. According to other hikers' online instructions, I would pass some radio antennae somewhere along the way, as well as an 8-foot tall rock cairn. I knew from my mental image of all the maps I'd studied online that my general direction was west by southwest, so it seemed I was off of a good start when the westernmost trailhead—the one I'd read I should follow—started in a giant traversing line around the bend of the mountain, pointed vaguely in the direction of Tooele. The Goshute word "oquirrh" has been translated variously as "cave mountains," "shining mountains" and "wooded mountains." It is said that forests once covered the slopes, but the demand for smelter coal by the mining industry, produced with local timber, denuded the hills in a matter of decades. From the valley, the Oquirrhs still look barren, but the trail I set off on ducked deep into a damp and sweet-smelling forest of aspen and conifer, crisscrossing many small streams along the way. The trail I took was not the trail to Kelsey Peak. I know that now. But, if I went again, I think I'd follow the same path. Unlike in the Wasatch, so orderly and precise, there's adventure to be had still in the lonely folds and rises of the Oquirrhs. Why not see where they take you?